My article Macron in India: Ties that keep growing appeared before the visit in The Asian Age and Deccan Chronicle. Indian and France are celebrating twenty years of partnership. The accord signed in 1998 by President Jacques Chirac and Prime Minister AB Vajpayee is one of the oldest, if not the oldest, ‘strategic partnership’. It was inked during the French President’s visit to India: “Both countries share a perspective that the new world order has to be a genuine multi-polar world order. Our bilateral relationship is poised to grow in the coming months in a multi-faceted manner,” declared Chirac. Over the last two decades, the partnership has steadily grown; no major political difference has darkened the sky between Paris and Delhi. France has constantly been supportive of India, particularly for a permanent seat for India in the UN Security Council and has shown comprehension for India’s nuclear policy. Though in recent years the term ‘strategic partnership’ has been devalued by the multiplication of such accords, in the Indo-French case, the 1998 momentum has been regularly sustained by new initiatives. One is of course the Rs 59,000 crore deal for 36 Rafale fighters in September 2016; it will soon prove to be a game changer, partly due the offset clauses forcing the French to reinvest in India 50% of the total deal’s amount, but also for India’s western and northern fronts. China realizes this, its recent efforts to reinforce its air defence of the Western Theater Command, particularly on the Tibetan plateau, is definitily linked to the arrival of the Rafale in 2019. These ‘sensitive’ areas make the difference. Delhi knows that it needs to diversify its diplomatic relations if it wants to play a major role in the world. An example: for India’s engagement in the Indo-Pacific region, France could also be a crucial partner. A highpoint of Macron’s visit could be a logistics accord allowing India access to the strategically important French base in the Reunion Islands near Madagascar. Another possibility is the opening of the French facilities in Djibouti in the Horn of Africa where India’s rival China has already a military base. This is part of India’s new maritime strategy. Interestingly, another author, Emanuele Scimia wrote in The Asian Times about a new alliance emerging in the region. He cited the French Jeanne d’Arc’s naval task force, heading for East Asia and the South Pacific to practice with the British Royal Navy. The task group consists of the Mistral-class helicopter assault ship Dixmude and the La Fayette-class frigate Surcouf. Does it mean a Quad + Two? India and France will probably prefer the bilateral way to start with. Incidentally, in December 1954, a previous avatar of the Dixmude, arrived in Mumbai to deliver 20 aircrafts with ammunitions: “Dixmude will stop at Bombay only for 5 days. In view of large quantities on board and short time available for off loading French air Ministry has requested for facilities as special case to unload explosives at Jetty instead of at anchor outside harbor,” wrote the then Indian ambassador in Paris. Four years later, 22 Mystere and 13 Ouragan (‘Toofanis’) would be again delivered by the same Dixmude. Another important development: during the forthcoming presidential visit, a deal could also be signed between India and Safran (one of the partners of Dasault in the Rafale deal) to develop a M88 engine for the Light Combat Aircraft (LCA) Tejas. A report in The Tribune recently hinted that “the M88 engine would be used as the base engine to adapt it for the LCA program or it would be an altogether new development using Safran technology to create a new engine from the ground upwards.” The LCA Tejas, manufactured by Hindustan Aeronautics Limited (HAL) is presently equipped with a General Electric F404 IN20 engine. India is obviously keen to resurrect the Kaveri engine project which was originally started in the 1990s to develop an indigenous jet engine. Safran has now offered to collaborate on the Kaveri engine program as part of the 50% offsets for the Rafale deal. Macron’s visit was delayed for a few months due to the importance of an important joint initiative, the International Solar Alliance (ISA). Launched at the UN Climate Change Conference in Paris in November 2015, the ISA wants to create a coalition of solar resource rich countries and address each participant’s special energy needs. 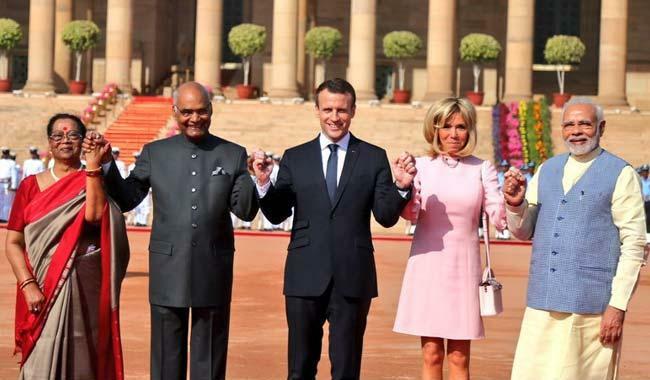 Finally, twenty years after Chirac’s visit, it would make economic and strategic sense for India to partner with France in more futuristic research projects such as a fifth-generation combat plane or an armed drone. Modi and Macron need to prepare the future. Xi Jinping: Chinese Emperor for life?